De-Bait-Able Wins The Inaugural Sailfish 400! An unusually slow bite forced 43 teams to make every opportunity count in the inaugural Sailfish 400 tournament held in Miami on January 16 & 17. A purse in excess of $574,000 kept the teams on their toes despite lackluster fishing. At any second, one fish could make the difference between 10th place and 1st place. After 18 hours of battle and several lead changes, team De-Bait-Able took the winner’s position with 6 sailfish releases that paired with a total payout of $174,510! During Day 1 of the competition Finster, in their 34-foot SeaVee,took the lead with five releases, winning the Tier 1 Day 1 optional entry calcutta for a payout of $29,700. Following closely behind was Asian Pearl in 2nd with four releases and OCD in the 3rd place spot also with four releases. The tables turned on the second day of fishing as teams that placed at the bottom of the leader’s board pushed their way to the top. BAR South, winners of Operation Sailfish, moved up to 2nd place for Day 2 after no releases on Day 1. That jump earned them over $50,000 in winnings. Team Priceless placed 1st for Day 2 with 4 releases and took home more than $36,000 in prize money. It was anyone’s tournament to win on Day 2 of fishing but team DeBaitAble separated themselves from the pack with a total of 6 releases collectively for both of the competition days. Their top position earned them High Point Over 40’, Leaders Board 1st Place, The Big Easy 1st Place, Top (561) Team and a piece of three of the daily calcuttas. 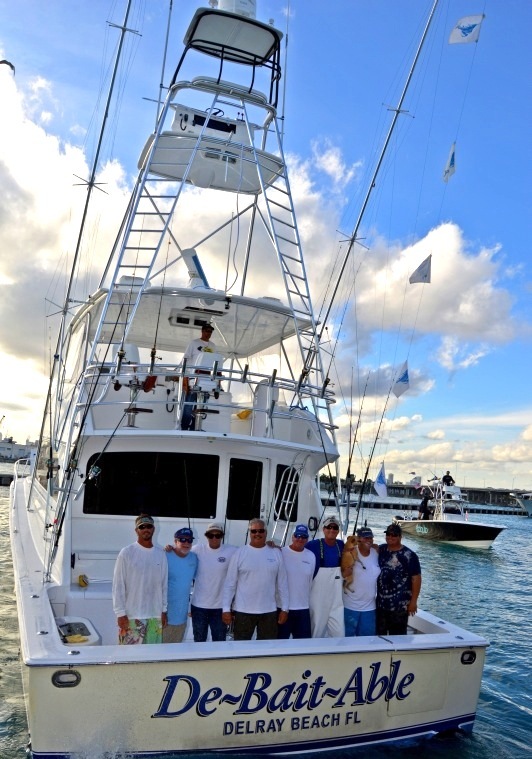 Asian Pearl also had 6 total releases and came in second place based on time, taking home $88,800 in winnings that included Early Bite Friday, Late Bite Saturday, High Point Boat Under 40’, 1st Place Tier 2 Daily on Day 1, the Charity Calcutta and Top (305) Team. The top 4 teams in the tournament were all tied with 6th releases, the winner being determined by which team released their last fish first. Master Angler went to Taylor Walsh of DeBaitAble with 4 releases and Top Female Angler went to Marie Diaz of Asian Pearl with 3 releases. Top Senior Angler for the Sailfish 400 was Charlie Greenberg with Crescendo and the Top Junior Angler was presented to Zach Murck of Never Say Never. The Big Fish Bonanza winnings totaled $13,950 and went to team Liquid with a 20.4lb tuna. They also netted over $48,000 in prize money with some daily earnings on Day 1 of the tournament. Vitamin Sea Too won the Mono A Mono division against 15 other teams and also took home the title for Top (954) Team along with 2nd place in the Big Easy for a total of $48,000 in winnings. Ties to NASCAR, Homestead Miami Speedway and it’s charity ‘Driving for a Cause’ were the inspiration behind the race theme for Sailfish 400. As an added bonus, the top 8 teams also had the chance to win an amazing prize pack from Homestead Miami Speedway. Six tickets to the Ford Championship Weekend that included the Ford EcoBoost 200, Ford EcoBoost 300, Ford Eco Boost 400, Pre-Race Pit Passes, Post-Race Victory Lane Access, Pace Car Rides and a VIP Parking Pass went to team Finster! Finster was also one of the top earning teams with a total of $48,340 in winnings. 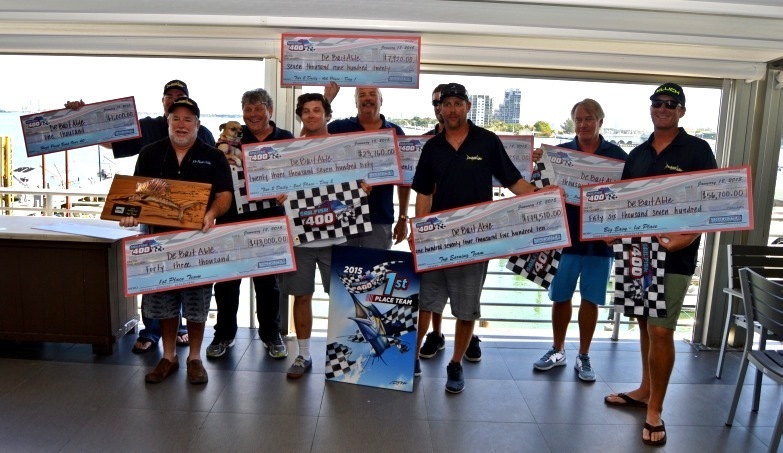 Seraphim Takes the Checkered Flag and $247,000 at Sailfish 400!